BTX Technologies has supplied 40 Gefen Digital Signage Media Players with Wi-Fi for use at the Resorts World Casino New York City. Purchased and installed by systems integrator The Integration Factory, the high-definition players are being used to deliver up-to-date dining information to digital menu boards located in the casino's food court and Aqueduct Buffet. Adjacent to the Aqueduct Racetrack in South Ozone Park, Queens, the two-story property offers 4,468 video lottery terminals and 550 electronic table games. 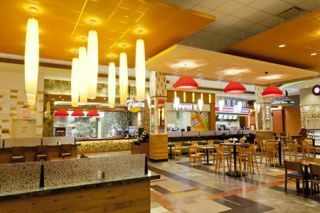 The casino features 17 dining options, including a full food court and the 400-seat Aqueduct Buffet. 40 digital menu boards provide patrons with current information on the availability and pricing of breakfast, lunch, and dinner items. Each display features a Gefen media player mounted directly behind it, which is connected to the casino's food court network server. This allows Resorts World technicians to access all local players remotely from the digital and A/V media office. "When selecting a player for the digital menu boards at Resorts World Casino New York City, what we required was a product that could be quickly installed and essentially forgotten," said Carlos Gonzalez, senior manager of business development at The Integration Factory. "The ability to update content quickly from a remote location has meant that the casino's busy employees have more time for other tasks." "The Resorts World Casino installation provides an example of how a basic digital signage media player can really enhance the user experience," said Hagai Gefen, president and CEO, Gefen. Gefen's Digital Signage Player with Wi-Fi is SMIL-compliant, and is a LAN-based product, which supports 1080p full HD, one-line scrolling text, two-channel L/R audio, and calendar scheduling with several preloaded templates. The all-metal enclosure features a passive cooling system. The product comes with 4 GB of built-in flash memory, while a securable compact flash card slot allows the addition of up to 16 GB of memory if needed — replacing the internal storage. Two integrated USB 2.0 ports provide connection to a keyboard and USB storage devices. Support for more than 20 different media formats provides a wide selection for content creation. A watchdog timer lets the product recover and resume playback after power and network disruptions.